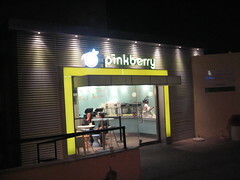 Not to say that Pinkberry itself hasn’t been in the center of controversy. From being accused of wiping out historic business establishments and intruding on the exclusivity serenity of anti-chain Abbott Kinney in Venice to rats being found in their Manhattan stores, they’ve definitely invited their fair share of it. And others, like Starbucks, have gotten interested enough to put their money where their mouth is by investing in it. So when I finally heard that Pinkberry had settled their case with the plaintiff who cried foul marketing and advertisingÂ and, as a result, is donating $750,000 of the total to charities, I was satisfied for the most part because when charities win, everybody wins. It’s barely a dent in their checkbook, I’m sure. So could it have been more? Of course. I might have even enjoyed the results more if it were. But at the very least, consumers are no longer duped can no longer blame Pinkberry for duping them because who-really-eats-frozen-yogurt-for-the-health-benefits-c’mon-let’s-be-honest-now? The list includes at least five additives defined by the United Nations Food and Agriculture Organization as emulsifiers (propylene glycol esters, lactoglycerides, sodium acid pyrophosphate, mono- and diglycerides); four acidifiers (magnesium oxide, calcium fumarate, citric acid, sodium citrate); tocopherol, a natural preservative; and two ingredients â€” starch and maltodextrin â€” that were characterized as fillers by Dr. Gary A. Reineccius, a professor in the department of food science and nutrition at the University of Minnesota and an expert in food additives. You know, I don’t say this often, but I will now because I can: I told you so. So you know what? I think it’s high time I sue the society of Los Angeles … for mental grievances caused by failure to conform to this wacked-out addiction. It’s like I was in a movie called, “28 Days: Yogurt Edition” or something. On one hand, you think you’re going crazy; on the other hand, you were pretty much correct in thinking you were eating crap. And on both hands, everyone else had the zombie eyes. Every single time I tried it, I tasted grit in my teeth. The stuff was too sour. It seemed to me that the yogurt was ruining good fruit, which were supposedly the toppings. Well, help yourselves, everyone. You still won’t see me standing in line. But supposedly, many friends of mine say CÃ© Fiore is the thing right now. In the same article above, NY Times cites the originator of the craze, Red Mango, as having truer ingredients. Ahh… Deep breath, now. Capitalism. Competition. What a beautiful thing. I’d try those places and report back, but since I never really caught on to the dessert, I’d rather just not force the issue and let it die. You know, let my dollars do the talking instead of the following. This entry was posted in Food, West Hollywood. Bookmark the permalink.